Common resident breeding bird in most of Europe, a summer visitor to Northern Europe. Absent in North West Scotland, summer visitor to Northern Scotland. A bird of farmland, hedges and woods, likes weedy places, often seen feeding on thistle heads. Can form large flocks in winter. 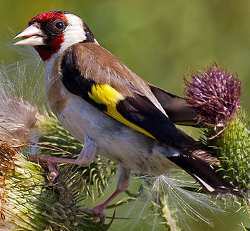 One of the UK's most colourful birds, the Goldfinch is unlikely to be confused with any other. In winter, it is usually seen in small twittering groups, however where a food source is abundant it can form very large flocks of several hundred birds. The Goldfinch is a colourful little finch, with red face, black and white head, yellow and black wings and a tawny-brown back. Both male and female birds are similar, this image shows the birds small but powerful bill, also note the white flashes on the black tail and the distinctive yellow wing bar, both visible in flight.